In case you missed it, the Queen turned 90 and there was a huge party in her honor last Saturday. Even if you aren’t an Anglo-maniac, the news of Queen Elizabeth’s celebration parade and activities have probably found their way into your daily life. I have reason to believe this, because I am literally half way around the globe in Southern Thailand and have still managed to see it in newspapers and online. People seem to love a good parade regardless of their native culture. You know what else people love? Who wore what. And this is especially true when it comes to the Royal family. Don’t believe me? Just visit the site WhatKateWore.com to see basically every outfit the Duchess of Cambridge has ever worn in public. You wouldn’t pick out just anything from your closet for your big 90th birthday celebration, and neither would the Queen. She picks out every ensemble with Anna Wintour-esque pre-meditation and this bright number is no different. Here are a few theories as to why stop light green made the final cut. It forces all eyes to be on her. Think about it. How do you keep the focus on a small elderly woman during the midst of a huge celebration featuring hundreds of people including a whole brigade of grown men wearing 3 foot tall black, furry hats? You put her in a shocking bright color that is a complete contrast to what everyone around her is wearing (ie: red. Remember the color wheel? Red is directly across from green which means that no other color will have more contrast and pop). Squint your eyes and look at the picture below. Where do your eyes go first? That’s right, the lady in green. It’s no coincidence that she choose the color that would stand out the most amongst the red any more than it was a mistake that everyone else is wearing bland, monotone colors that all blend well together. If it were my 90th birthday, you better believe that not only would I have a kickin’ outfit, but that no one else would be outshining me. Well done, Queen. It’s actually quite flattering. For real. Scroll back up to that close up shot above and take a good look at her face. She isn’t washed out at all and the neon really works for her skin tone. Her face, hair and skin all look bright and even. As someone who’s been in the spotlight for decades, no one knows better than the Queen that if you’re going to be in the spotlight, you better look great. It was a strategic move to appeal to a younger generation. Within minutes of the Queen’s grand appearance, the hashtag #neonat90 swept Twitter. Thousands of Millennials that would usually just tune in to check on Kate’s outfit, all of a sudden were paying attention to the Queen. And not only were they paying attention, but they probably saw the Royal family as a whole in a new light: modern, current, and relateable. In an era far from the aristocratic times reminiscent of Downton Abbey, the Queen (and Royal Family in general) have a constant challenge to stay relevant to the youth of Britain. As icons representing the country, it’s important that the family reflects the sentiments of the British people- including the growing youth population. 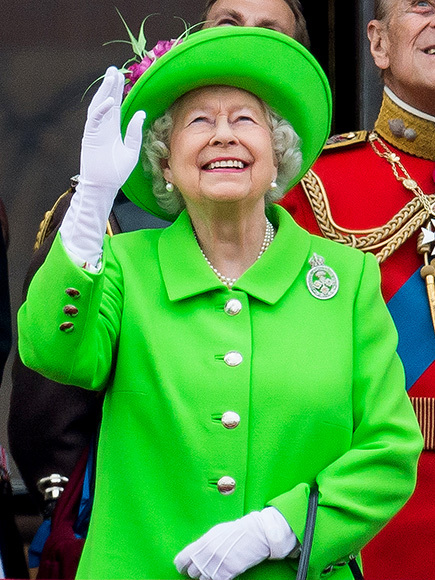 Or, maybe I’m over analyzing it all and green just happens to be the Queen’s favorite color. Either way, she looked great.